Elkhart Plastics, Inc. is the premiere manufacturer of DEF tanks in the United States. Since the implementation of DEF and SCR systems in Europe and the United States, we have worked to develop custom DEF/Adblue tanks alongside OEMs to provide on-vehicle solutions, working with clients to create unique shapes to fit the end product. Recently, we added a line of proprietary “off-the-shelf,” fully-integrated, plug-and-play DEF tanks, along with a line of remote fill solutions of spill trays, as well as unique and diverse valve and venting systems. Our proprietary tank solutions enable you to easily configure a tank and header for a variety of applications and fast lead time custom options allow us to help solve the most difficult packaging situations. We utilize the most capable header sensors on the market through a unique supplier partnership. These sensor headers measure the temperature and quantity of the fluid level in the tank, as well as monitor the quality of the urea solution. We currently have more than 30 sensor geometries available for custom applications in combination with six proprietary DEF tank sizes in 5, 10, and 15 gallons (portrait and landscape). Contact us for a quote for your specific combination of needs. You may also download our proprietary DEF tank brochure and specs (PDF). 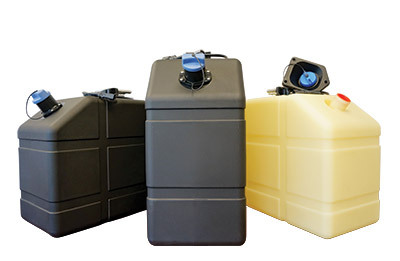 We are an American company that provides the highest quality rotationally molded plastic DEF tanks. With our large capacity for production and multiple locations across North America, Elkhart Plastics, Inc. can help you accomplish your goals. Between the agriculture, construction and heavy truck industries, Elkhart Plastics, Inc. manufactures several thousand DEF tanks each month. In addition to rotationally molding the DEF tanks, we also provide customized secondary assembly services. This product is manufactured in our Middlebury, South Bend, and Ridgefield plants.